The town of Carmarthen is sited on the river Towy some eight miles north of its estuary. It is a small town of around 15,000 inhabitants and lays claim to being one of, if not the oldest town, in Wales. 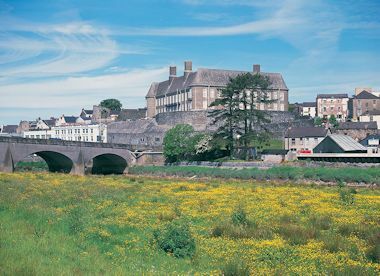 It was in 1546 that the two settlements of old and new Carmarthen joined to form a single town, that between the 16th and 18th centuries became one of the most densely populated areas in Wales and was quoted during this period as being perhaps the chief city of Wales. Alas, the population dwindled during the 19th century as people moved to the more prosperous areas of the South Wales coalfields. The origins of Carmarthen can be traced back to pre-Roman times when it was the capital of the Demetae tribe and was known as Moridumum (meaning ‘sea fort’). Ptomemy records the town in antiquity. It is also mentioned in the Antonine Itinerary, which is a register of the stations along the various roads of the Roman Empire and lists the distances and directions between the various Roman settlements. A most interesting feature of Carmarthen is the Roman fort, which is believed to date back to AD75. Close to the fort can be found the remains of an amphitheatre, one of only two such sites in Wales. The other being Isca Augusta in Caerloen. The amphitheatre was extensively excavated in the 1960s during which the total area it originally covered was calculated to be some 95 yards by 70 years, within which sat the actual arena of some 50 yards by 29 yards. One can only imagine what activities took place there all those years ago. By medieval times, the town that eventually became known as Carmarthen was called ‘Llanteulyddog’, or the town of St Teulyddogs. At that time it held considerable sway as an important religious centre and was one of the seven principle ‘sees’ in Dyfed. The strategic importance of the site, originally recognised by the Romans, continued to be so during the medieval period. It was around 1094 that a Norman noble, William fitz Baldwin is credited as having started the building of a castle in Carmarthen. With more certainty it can be confirmed that the existing castle site is known to have been in use since 1105. Alas, the original castle had a relatively short life span before being destroyed by Llwelyn the Great a little over 100 years later in 1215. By 1223, the castle had been rebuilt and more importantly was accompanied by walls that protected the town itself from further intrusions. At least, that was, until the town and castle were attacked and sacked by Owain Glyndwr in 1405. 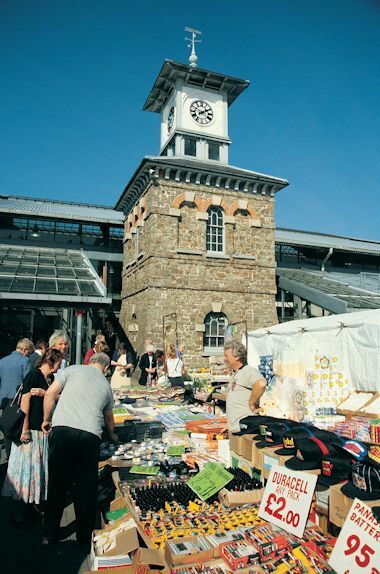 Carmarthen is know for the famous ‘Black Book’, which is understood to be the perhaps the earliest surviving manuscript written almost entirely in Welsh around 1250. It’s name comes from the colour of its binding and it is association with the Priory of St. John the Evangelist and Teulyddog at Carmarthen. The book contains poetry and references to Welsh heroes including the legend of Arthur. A place of gruesome interest in the area is the graveyard that adjoins the 'Maes-yr-Ysgol' and 'Llys Model' housing at the rear of St Catherine Street. It is here that mass graves can be allegedly found that contain the victims of the Black Death that visited the area around the 1340s. The town also witnessed the burning at the stake of the Protestant martyr Bishop Ferrar in the town square in the 1550s as part of the ‘Marian persecutions’. Around this time the local Priory and the Friary were both ravaged and abandoned due to the dissolution of the monasteries by Henry VIII.